When you think of small evergreen shrubs, do you have an image in your mind of short, rather uninteresting lumps of green dotting a landscape? Well, you should not. There are plenty of compact bushes out there that are quite colorful characters. It is just a matter of knowing about them. Many first-time growers of these small evergreen shrubs become quickly impressed with this plant, and you too will come to enjoy its prodigious blooming period if you decide to grow it. 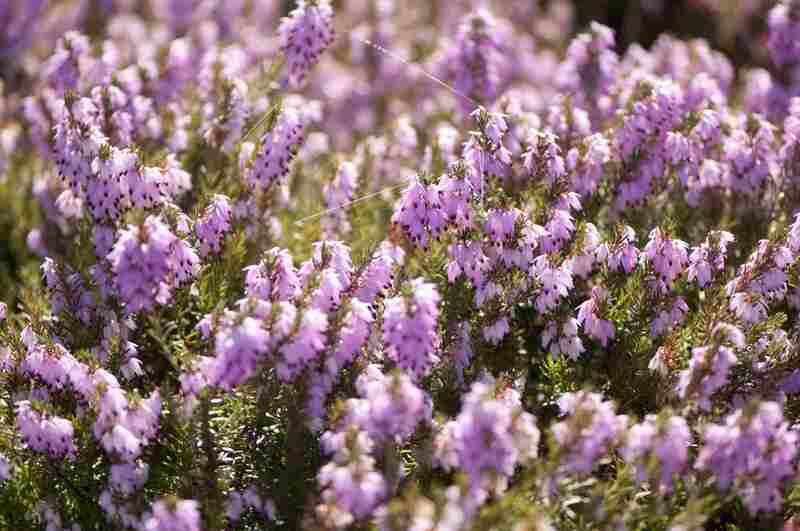 Winter heaths (Erica x darleyensis) live up to their name by putting out flowers in that most unlikely of seasons—wintertime. This plant is at the top because if the climate and conditions are right, it may end up flowering for about half the year for you. Mountain laurel (Kalmia latifolia) is a broadleaf evergreen that you may be very familiar if you have been on walks through the woods in New England in June. In fact, it is the state flower of Connecticut. The laurel bushes you find in the forest can become quite large, but the "Minuet" cultivar, true to its name (think "mini"), is a dwarf. That is a plus for urban or suburban landscapes where growers may not have much room to spare. This compact bush offers another advantage over its wild relatives, too—the flowers are more colorful. The first two entries, while they do bear evergreen foliage, are grown mainly because they are standout bloomers. Not so with this third entry on the list. Blue Star juniper (Juniperus Squamata "Blue Star") is strictly a foliage plant. If you like the look of, for example, blue spruce trees but lack the room for something so big, simply scale down and grow a Blue Star juniper. With their short blue needles, they look especially good when planted next to shrubs with golden foliage. Euonymus are evergreen bushes that exhibit some sort of variegation in its leaves. Its descriptive name explains the look of its bicolored leaves pretty well. The leaves are emerald at the center and gold at the margin. Another bicolored euonymus, "Emerald Gaiety" offers a different color combination from "Emerald 'n' Gold"—and from that of the euonymus that occupies the next spot on the list—green and white, instead of green and gold. The admixture of white in the leaves gives this small evergreen shrub an overall bright appearance, which may help account for its cheerful name. With "Moonshadow" euonymus, we come back to a green-and-gold pattern of variegation. But if you study the picture carefully, you will see that Moonshadow's colors are reversed with green at the margins and gold at the center. You may also notice that, on some of the leaves, the gold color is replaced by an off-white, instead. This happens as the growing season wears on; the spring foliage displays a shiny gold in the center. Both "Moonshadow" and "Emerald 'n' Gold" are at their best in spring. Of the three euonymus bushes, the best for a ground cover in a small space is Moonshadow. Its foliage grows densely, it is colorful, and it remains a short, compact bush with just a little pruning. Furthermore, it exhibits very little inclination to revert back to an all-green state (unlike on "Emerald 'n' Gold"). Dwarf English boxwood (Buxus sempervirens "Suffruticosa") is not as colorful as the other small evergreen shrubs in this list, but its classic foliage is attractive in its own right and it makes for a good foreground or background for other plants. Here is one idea to consider. Set off a border of red salvia, under-planted with white sweet alyssum flowers with a hedge of dwarf boxwood. The rich green backdrop of the latter will enhance the viewer's appreciation of the red and white flowers. Yuccas, when the plants are massed together, form an impressive display during their blooming period. But the types with golden foliage (such as "Garland’s Gold" and "Golden Sword") are a better choice if you want something colorful, because they provide bright color even when not in bloom. Yucca filamentosa can give your yard a Southwestern feel even if you live in the northeastern U.S. Which of These 5 Beautiful Holly Shrubs Is Right for You? Do Evergreens Have to Actually Be Green?